Home » Blog » Well-deserved recognition of Granny Cathleen! GUELPH, ON. 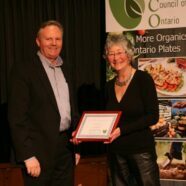 – Cathleen Kneen, outgoing chair of Food Secure Canada, was presented with a lifetime achievement award from the Organic Council of Ontario at its recent Organic Conference held in Guelph. Her contribution to organics started many decades ago as a farmer in the Maritimes with her husband, Brewster. Cathleen’s work in the food systems movement has always been cutting edge. Her mentorship of community food activists across the country has created a generation dedicated to including farmers and food producers in the food security discussion. She has championed organic production as an integral part of both emergency food and long-term sustainability.